In a display of solidarity, both the Catholic League and the Anti-Defamation League have called on Susan Sarandon to apologize for saying over the weekend that Pope Benedict XVI is a “Nazi.” (She offered praise for his predecessor, John Paul II.) Sarandon, who won an Oscar playing a Catholic nun in “Dead Man Walking,” made the comment at the Hamptons Film Festival. As a boy, the Pope was a member of the Hitler Youth. As a high-up in the church, he has helped cover up the child-abuse crimes committed by priests. He insists at virtually every opportunity that condoms should not be used to prevent the transmission of AIDS, even though it has long been known that condoms can help prevent the disease’s transmission. He is forcefully against women having equal participation in the church. He denigrates the desire of gay people to marry, even though it would be a stabilizing force for their families and relationships. Technically, the Pope may no longer be a Nazi. But the psychological and physical violence that his pronouncements foster certainly deserve a description equally severe. If Sarandon apologizes for her word choice, I hope she finds a term equally forceful to describe what millions of people — many Catholics included — think about the Pope. I have HAD IT with ALL organized religion. But Catholicism is the most barbaric and cruel of western religions, and I can say that as the son of a lapsed Catholic. As for the pope, he should be publicly flogged in the main square of Vatican City for all the suffering he has engendered and catalyzed. Couldn’t we please try a world without ANY religion for, say, a year? It’s all about imaginary best friends in the sky, and it has led to more unnecessary pain than it has generated succor. 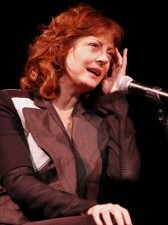 Meanwhile, you go, Susan Sarandon. I have always loved you. You always seem to get things right.